Detailed discussion on what it means to play a character of each of the three good alignments, including ideas for character generation and specific challenges of these alignments. A look into good-aligned races, good-aligned homelands, and good-aligned organizations for your character, as well as some of the challenges of being good and what happens when good characters come from bad places. A method for redeeming evil characters who your adventuring party encounters during the campaign. New good-based feats, magical weapons and gear, rage powers, rogue talents, subdomains, and more! I liked the first half, which explored the different ways to support the cause of Good, but I thought it lacked depth and I would have welcomed more discussion and examples of gameplay or stories in the campaign world for context. e.g. the illustration of Valeros in the Neutral Good section helped me understand what the writers were trying to convey. I found the second half less interesting, but those who enjoy technical details may find it useful. My main gripe is that I expected a focus on Champions and the stuff that champions do, but I felt like I was reading the guide for Men-at-Arms or Sergeants for Purity. Champions of Purity will be useful for some good characters, and I think this depends less on the character’s class and more on the character concept. If you are creating a character that is built around his or her goodness – call it good with a capital “G” – I think there’s a fair amount of useful material here, no matter what class your character is. If not, you will probably pass over most of the character options for ones in other sources that provide more mechanical benefit or highlight other aspects of the character’s personality, talents, and backstory. There’s also a fair amount of space devoted to collecting information found in other sourcebooks (e.g., good-aligned deities, races, organizations, homelands, nonlethal weapons, spells with the good descriptor). I am giving it 4 stars because if you are picking this up specifically to help you build characters which are "actively" rather than "passively" good, I think it works well. See my full review at my blog Delver's Diary here. Champions of Purity is a good quality product with large collection of rules options for most classes along with a range of role playing advice for anyone interested in a playing a Good character. Champions of Purity starts with an examination of good, trying to answer the general question of “Why to be good?” and then focusing in each of the three alignments individually. It provides generalized motivations for any sort of good character along with locations where characters with each motivation might originate. This provides a nice connection to Golarion in a book that is relatively light on setting details. The different alignment focuses provide examples of different types of philosophies that characters of a given alignment may fall into, along with some of the pros and cons of playing each good alignment. Golarion specific information about opportunities and allies that each alignment may be involved with round out the sections. The only concerns I have with these sections are the listing of the different philosophies, and with the included traits. I worry that players reading these, especially if they’re new players, may see the philosophy suggestions as more rigid limitations rather than just possible ways for characters of each alignment to be portrayed. The traits in each section are listed as complementing a given alignment, but having them listed in a section devoted to that alignment gives the impression that they’re only for that alignment. The next section is entitled Paragons of Virtue and covers a range of setting information to make a completely Good character, what race to play, organizations to be a part of, and where to be from. Generally this is presented well though I was surprised that none of the good churches were mentioned under the good aligned organizations. The inclusion of countries in Tian Xia as potential character origins was nice, as Tian Xia is often underrepresented in most products. There’s also a list of potential Prestige Classes for good characters, which I appreciated because it’s often hard for players to know about what classes are out there, as they show up in a variety of products. One minor complaint I did have here was that in one of this sections traits they mention an empyreal lord; it seems like there should have been an explanation somewhere of what an empyreal lord is, as players may not know this. This is followed by Good Characters in Bad Situations, which examines moral quandaries that good players may find themselves in, and shows how different good characters may react to the same situation in different ways. This is quite well done as it covers situations that may come up during gameplay, though a greater list of actual evil acts would have been nice. The list of how good characters fit within “evil” nations is nice, but all the different lists of where good characters come from makes me think that perhaps they all should have been together. It also seems like it could have been a good place to cover how good characters deal with worshiping neutral (or even evil) deities. The center spread in Champions of Purity is devoted to Heavenly Virtues, creeds for players to live by that provide benefits when the associated feat is taken. All of the benefits seem to be reasonably balanced, but the creeds will require some DM work to keep track of, as breaking a creed means the character loses the benefit of the feat. Some creeds may not be appropriate in all campaigns as the situations they reference may not be present, making them impossible to violate. The art on these two pages is great, with a stained glass style that really works with the virtue theme. On the topic of virtues, I’m starting to feel like Virtue is becoming a bit of an overloaded term, now it may be because I’m running Rise of the Runelords where they come up a bit, but perhaps a different term should have been used. Redemption is covered next, with a rules framework for an evil character to be turned from the dark side. It seems like a good system to me, though it will require a large amount of DM tracking; a lot of that could probably be avoided by combining it with in game story events. It does include rules for one or more characters helping a character seeking redemption, but I feel that some examination of how a PC could help an NPC seek redemption in a more role playing sense would have been good (and potentially more frequently useful). The remaining sections of the book are a collection of character options, firstly separated up into Divine, Combat, Skilled, and Arcane characters, and then followed by new spells and items. The divine portion provides details of all the good deities which complements the inside front cover where all the deity’s Domains, Favored Weapons and the like are listed. A number of new subdomains are presented, with Cooperation and Redemption having the most interesting powers. For combat focused characters there are new rage powers and inquisitions, as well as a handful of new feats. There’s also a sidebar on taking enemies alive, going over the rules and options relating to subdual attacks and binding opponents. Some coverage of how to bind someone during a grapple and maybe a feat to go along with it would have been good fit here. For skill based characters there are new alchemical discoveries, masterpieces, and rogue talents, to go with a sidebar on character types for less straight forward good characters. The most interesting new options here are a couple of discoveries that can forcibly change the alignment of the imbiber. Included in the descriptions are the moralistic questions that arise from forcing an alignment change on someone. In the Sublime Spellcasting section arcane casters are the focus, with summoners getting new evolutions, witches getting new patrons and hexes, and wizards getting new arcane discoveries. The mechanics of the Celestial Appearance evolution are interesting, where it’s one 3-point evolution with an increasing point cost if you want to do more with it, so it can be up to a 7-point evolution if you so desire. Based on its name and effect I can see a devil/demon/etc. version showing up somewhere along the line. In Spells of the Just there are 10 new spells, all with the good type, and a sidebar detailing a scroll that contains them all. I particularly like the Angelic Aspect chain of spells, and Burst of Radiance. For magic items there are a couple of new weapon special abilities and then 9 new magic items (which are said to be wondrous items, when only 2 of them are wondrous items). Surprisingly most of the items are new magic weapons or armor, with only 2 being not combat related. The neatest one is probably the Mantle of the Protector, a way to share some of a character’s armor bonuses. My only concern with all this new rule content is that a lot of it makes players very good at killing Evil things, which may make it on the high end of the power scale in campaigns with few neutral opponents. For instance I can see this material having a big draw in the upcoming Wrath of the Righteous AP. The art in Champions of Purity is top notch, with good portraits of most of the iconics and a few others; I especially like the ones of Feiya and Kyra. The cover is also very good; however the two other larger pieces in the product are not really to my liking. On the topic of graphic design the font used on the cover and as the section headers is truly awful, I understand that its look probably matches the content of the book is some fashion but this is a situation where function is more important than form. 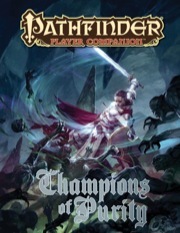 Champions of Purity is a great product which adds to the quality of the Player Companion line. There’s lots of interesting material here both for those looking for roleplaying ideas and suggestions and those looking for new mechanical tools to play with. A similar book for the neutral alignments would be good, as I find it harder to player neutral characters than good, though it may be hard to find as much neutral specific rules material as there’s fewer obvious things to build off of and because the core rules are written in a rather neutrally aligned way already. I agree with almost everything that the previous poster mentioned (except the 3E material). There are areas I wish they had gone more in depth or expanded upon a topic, but over all, a very good book. Unlike many of the other player's guide books, this one does seem to offer options for basically everyone, rather than focus on a handfull of classes. The amount of mechanics in this book is great, and shows that it doesn't detract from the fluff material. Not too much of it is terribly etting specific, either. The art is pretty good, particularly the cover and the center fold, while most of the other art is generally just various iconics is some sort of pose, but not really relvant to the topics. The magic items are ok, not great. Nothing really jumps out, with a lot of it at the higher GP end. The spells mostly look nice. I'm not really sure, (yes I know that Alchemists are their new baby and all) that the Alchemist's materail either needed to be in this book or was really thought out that well. Even at 12th+ level, a single save that can rob some clases of all class features (and can argueably require an Atonement even if it's a temp thing) probably needs to be errata'd a lot or out. I'm very happy that Roles where not included in this book. Don't care for them. The Virtues look good, though I wish there there where more, or perhaps some of them would be switched out. I'm sad to see that they require a Feat to utilize, as I'm not sure most of them really are worth a Feat, and what's worse the main classes that the flavor really fits are generally the ones that are totally Feat-starved. About the same power level as the Knightly Traits in Knights of the Inner Sea, except in general even more situational, that I'm not really sure they are really worth a Trait. Other than that, they are great and look interesting. All in all, a great and fun book. I would love to see more books like this, both in the amount of material presented as well as focusing on Good, heroic characters and play. I'd definetly buy a Champions of Purity 2 and 3, or a similar book that is not setting specific, but along the same lines. This sounds great! Fingers crossed for Champions of Balance and Champions of Corruption as well! Thank you, Paizo. Thank you. This one ripped back in time and sank Atlantis. But everyone that wasn't an Atlantis Thalmor Nazi ejected in time G.I.Joe-style so it's okay. Approx. 164 days left, Central Time. A redemption inquisition? Non-religious good-guy organizations? Goblin babies? Oh my. Fetch me my fainting couch, I feel all swoony! Make that two fainting couches and some smelling salts. Ok, marking the calender and starting the count down now! I'm really curious about these new fighting techniques. Maybe something that "perfects" subdual damage attacks to prevent accidental "rollover" deaths? Or something else built from the ground up around subduing? I really like that the alignment-changing alchemy, however it actually works, is called "morally challenging" upfront. That really beats just using helms of opposite alignment or sanctify the wicked and calling it a day without confronting the difficult questions that arise from using such methods. Wondering at the "how to get paid for being a good guy" bit. Can't help but wonder if it'll be a new paradigm for handling WBL matters for characters that don't want to go the home invasion economy route. Bounties on evil items, or boons from benefactors/benefactees, or just karma paying off? Or a discussion on how and where to seek funding for idealistic characters? Holy Sorcerers, Holy Witches, Holy Wizards, Holy Bards, Holy Rouges, etc. would be nice. Alignment-changing alchemy? That sounds -- odd. A Turn Undead/Evil option for inquisitors? I'd love that. A Gambler class would be cool despite the bad pun. I think a big part of this is that they wouldn't need to be holy--you can be a paragon of good without any religious connections. I think he means(and I know I do) support for characters that are squarely on the side of celestials and pure Good that aren't in divine classes. Barbarians with celestial totems and such. After all of this time how many happy pills would you need to take to recover if they don't include celestial barbarian totems? Does this mean there will be a Champions of Corruption and Champions of Balance to follow? I would like to request an expansion of the Summon Monster list to include more Good aligned creatures. There are 7 such creatures on the list, 3 of which are in Summon Monster IX. I want my Angel Summoner. We would need more low to mid level celestials to make a new summons list. In fact if one day they get enough of each of the major kinds they could have summon spells for Angels, Azatas, Agathions, or Archons. That book looks really interesting. Especially the part about goblin babies :-) : I mean, perhaps it will allow Pathfinder to be less of a slaughterfest adventure-wise. I like to slaughter fundamentally evil baddies as much as the next guy during my tactically-oriented fantasy RPG play, but perhaps this book will give us mechanics to play in less gory ways. Cheapy, given that previous policy has been NOT to expand the choices on the existing spells, you're more likely to see specialized spells that only summon Angels, or Azatas,or Agathions, etc. At least, that's my guess. Alternatively, the customized summoning lists variant from Unearthed Arcana should still work in Pathfinder. What do you do with all those goblin babies? The Golarion line has done quite a bit of extending of the summon monster lists, mostly in the articles about organizations or deities. So I have hope! Ay who wants to be a champion of corruption when you can be a lord! Thanks for the back up, Kyle. I loved the "Faiths of..." series and that's why I thought a "Champions of..." series would dovetail perfectly with them. Cook them of course. They taste like Chicken. It's not cannibalism unless you're a Goblin after all. And if you are, that probably won't stop you. Lets see how the first one goes and, based off of that, we'll see. I always hate to say this, but it the best way for us to gauge the audience's interest in a project is to see how it sells. So if you want to see this turn into a sub-series with the entirely hypothetically Champions of Balance and Champions of Corruption, first let us know you want to see it, but even more importantly, check this one out in whatever way is financially feasible for you! If no one gets this, we'd be fools to do more. If everyone gets this, well, then we'd be fools not to. And if you really like this theme and haven't checked out the refreshed Player Companion line yet, now's the perfect time to check out the awesome new direction! Despite the connotation of the mock-up cover, this is not a book all about religion. There will definitely be options for divine casters, but don't expect this to be all religion all the time. Keep an eye out later in the year for our book on Crusaders, which will be all about the religious agendas of a variety of Golarion's deities and how to play faithful characters of all classes. Gross. All of the gross. Is that Iomedae on the cover? That's a mock-up. The final cover will be of ADVENTURE! It's Iomedae, for some reason disguising herself as a fourteen-year old.